I just finished Killing Cockroaches: And Other Scattered Musings on Leadership by Tony Morgan. Let me just come out with it, I would recommend this book to all pastors. I think Tony has some great insights on leadership and the church. I don’t agree with all of Tony’s assumptions about church or about what would make a successful church, but it’s still a good read. Reading Killing Cockroaches felt like reading a Seth Godin book. Quick sections, funny, precise, and honest. All of that helped reading the book go really quickly. So I commend that. It did feel like the way Newspring does church is the way to do church, and that get’s annoying as we do church very different, but the heart to reach the lost is the same. And I think for churches context is key, once you learn the context your church ministers in you can develop methodology. 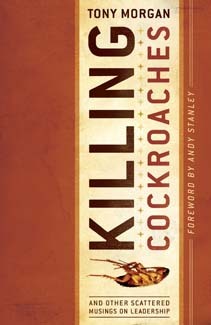 But the most valuable thing in this book is probably overriding metaphor of Killing Cockroaches, which is really doing something you should not be doing, get a professional to do that. And in church there is a ton of stuff that I know that I should not be doing, it’s not the best use of my time, and there are others who would be way better at it than me. It’s a good reminder that I need to carefully guard what I say yes to, and what can I help others to do. That sentence was a bit rough, but I think you get my point. Anyway, get Killing Cockroaches, you’ll enjoy it.